With cold winter months around the corner, I’m starting to crave comforts foods like Colorado green chili, tortilla soup, and meatloaf. However, it’s still in the 90’s outside, so a warm bowl of soup still doesn’t suit the palate just yet, but that doesn’t exclude meatloaf! I know, meatloaf got a bad rap when someone decided to dirty it up with huge chunks of veggies and super market meat that was as far away from fresh as it gets. Kids across the country have grown up never knowing that meatloaf can actually be good. You have to start with fresh ingredients, and then look for the taste you want in your meatloaf. My mom made hers taste like pizza, throwing in tomato sauce, cheese, fennel, Italian seasoning, and other yummy herbs that typically go into Italian dishes. I like her recipe, but I once came across a simple recipe that called for eggs, stuffing and barbeque sauce. That was it, and the recipe was really good, but I knew it could be better. By taking that same concept, but adding in additional flavors we liked – always add onion and garlic, always – I finally found a recipe that was (as my family says) heaven in your mouth! Like little drops of meatloaf heaven dancing on your taste buds, you’ll re-think your childhood hatred for that meat in a loaf. I swear that the secret is the barbecue sauce and fresh/organic ground meat. We are a family of hunters, so we always have a lot of ground elk and venison on-hand, but you could just as easily get the ground meat from your local organic market. The recipe below makes a rather large loaf (2 pounds of meat), but when I’m feeding my family of 4, I want to make sure I have plenty of leftovers for meatloaf sandwiches the next day. Even then, sometimes they just keep eating until it’s gone! For a healthy mashed potato side, try my cauliflower mashed potato recipe. Sometimes this recipe can come across a bit sweet. If you find that’s the case, then cut back on the brown sugar and BBQ; however, I’d advice trying the recipe as is, first, so you know where to cut back. My family has always slathered their meatloaf in ketchup – perhaps to hide the taste, I don’t know (I do it to… it’s tradition, I suppose) – but with the BBQ sauce on top with this recipe (instead of the baked on tomato sauce), my family doesn’t even ask for added ketchup. The BBQ sauce does the job of fixing that yucky, caked on tomato bake that you’re used to seeing, and gives enough extra moisture that the ketchup isn’t needed. One more thing, instead of doing one big loaf, opt for multiple mini loafs. I like doing this if I don’t think we’re going to eat an entire loaf for dinner. I can then freeze my extra loafs to either cook fresh in the future or just heat up if already cooked. When I’m freezing them raw, I usually do the the throw away metal, fold-able containers you can get at the grocery store. They’re tiny – like 5″ x 3″ (estimating here) – and I can pack the elk meatloaf in the container, wrap, and freeze for individual meals in the future (when our boys leave the nest, this will likely be how mom and dad continue this meatloaf tradition). Like little drops of elk meatloaf heaven dancing on your taste buds, you’ll re-think your hatred for meatloaf with this elk recipe! Place all of the ingredients for the meatloaf (except for the egg) in a large bowl. Beat the eggs in a separate bowl, then pour on top of the meatloaf mix. Spray a baking sheet with olive oil, or line it with parchment paper so you don’t have to clean the mess up afterwards. This step is important, because with the next step you’re getting dirty and you need to prep before that stage. Take your rings off and get to mixing all of the meatloaf mix together. Squish, squish. Pour all of the ingredients out on the baking sheet, and form into a loaf. I like to form it so the slices are the size of sandwich bread – always thinking ahead. 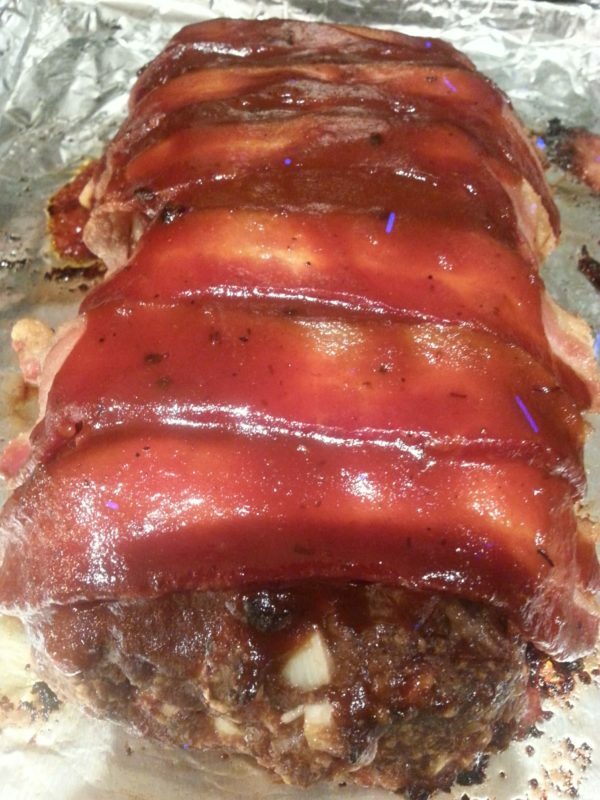 Place the partially cooked bacon over the top of the meatloaf. 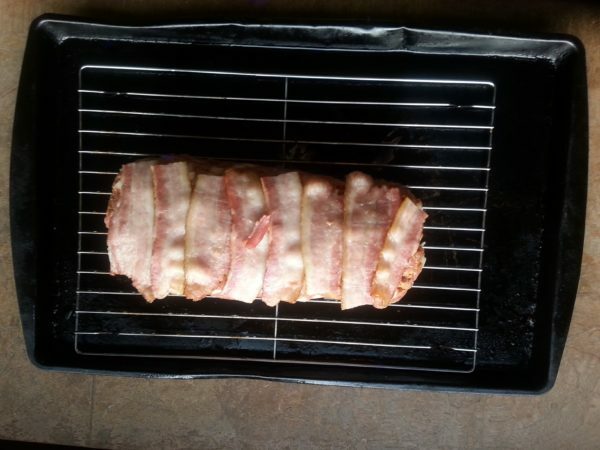 With this, I either cut the bacon in half so it fits right, or I’ll tuck long ends under the loaf. If you’re on an anti-bacon diet, then cut this out, but I’m telling you, you’ll be missing out on some great flavoring. Bake in oven for about 40 minutes. Or if you have a meat thermometer, cook until it reads an internal temperature of 160⁰F. 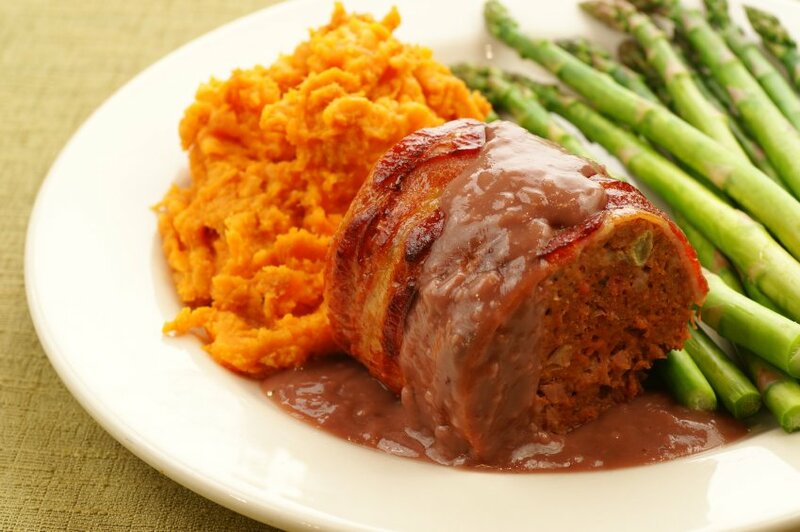 10 minutes before the meatloaf is done, mix together the remaining ingredients – barbecue sauce, brown sugar, and Worcestershire sauce – and heat on oven until it starts bubbling. Turn it down to a simmer and cook for 5 minutes, stirring often. When the meatloaf is done, pour the sauce over the top, and let it rest for 5 minutes before digging in. I was lucky enough to find elk at my local New Seasons, usually I only get to enjoy elk when I’m in Canada visiting my family so I’ve never actually cooked it myself… when my husband suggested I make meatloaf with it I googled Elk Meatloaf and thought your recipe was the most intriguing. I split the recipe in half since I only had one pound ground and used panko bread crumbs and fresh sage. It was delicious! my whole family loved it and I’ll definitely be making it again. Yay, glad you enjoyed it! I’ve never seen elk in a grocery store, but it’s nice to hear that it is available especially for non-hunters. And now I’m craving it too! Truly enjoyed! I Carmelized the onions prior to adding them and added chopped bacon to loaf. Turned out fantastic! Nice, I’m going to try this variation tonight. I like the idea of the carmelized onions and the bacon in the loaf. Mouthwatering! Happy I’ve stumbled across your site! Living in Ontario my boyfriend and I hunt deer and moose, but he had the chance to go to Colorado on an elk hunt resulting in 88lbs of a new meat in my freezer I’m not entirely sure what to do with! Congrats, that’s awesome meat to have in the freezer! Meatloaf is definitely a good start, but there are SOOOOO many great elk recipes! I just did one on elk carpaccio that was to die for, but again, you’d have to be okay eating the meat raw, which can be tough for some people. As long as it wasn’t a gut shot or no glands were cut during processing, you’re good to go (after it being frozen first). Other than meatloaf, however, I usually don’t like to add in a bunch of spices. That just masks the flavor. We make a lot of steaks, roasts, and fondue. No pressure, right! I’m glad it turned out good, especially for a crowd of that size. I’m actually making this tonight, but with venison meat – it turns out just as good! I’ve been craving it – can’t wait. The best meatloaf ever! My very modern family (roommates and kids 2-15) all 8 of us LOVED IT! The raves at the dinner tabke tonight continued long into the night. I followed it almost to a t. The 2 changes where… i carmelized the onions (as suggested in prior comments) and I diced some uncooked bacon and mixed it in to the mixture. The best best best meatloaf ever! My husband just filled our freezer with elk and I tried this meatloaf recipe first. It drew rave reviews from my family and I will be making this one again and again. Thank you! This amazing recipe is now a regular in our home. Luckily we can purchase elk in Colorado, bit sometime we just use bison or beef. Thanks for helping make my hungry boys happy boys. This meatloaf recipe is really great, so glad I happened upon it. I also added bacon to the inside. Question about the crackers. What type and how much are you using? I measured out 2 ounces on a food scale and it was almost an entire sleeve of saltines! I’m glad you enjoyed the recipe! I measure out 1 cup of crushed crackers to add to the recipe. I usually use some sort of whole-grain crackers – whatever is in the pantry – but usually for us, we have Wasa whole grain crackers in the pantry. I like those because there’s not much salt in them, so it doesn’t throw off the recipe. If you’re reheating already cooked (then frozen) loaves, what is the best method? If I freeze them, I usually prepare them in smaller portions, say small 5″x2″ aluminum throw away baking pans or muffin tins, but do so raw, not cooked. And when I’m ready to cook them, I cook them frozen at 350°F for about 45 minutes. Of course, when I freeze them, I package them in a way so that I remove as much air as possible – zip lock bag, plastic wrap, freezer paper, etc. Anyone living in cities with a good source of farm raised meat will have ground elk, venison or bison. Those are the easiest preparations to begin experimenting with when trying game meats. My family is fortunate to have elk and deer in our fields in Montana. It pains my husband to hunt even though we love the quality of the truly organic, lower fat red meat. If you have a restricted diet this is a great way to keep fat down. Maybe skip adding bacon in the recipes. Experiment with proportions of cream or half and half in the meatloaf to find your family’ idea taste profile. Personally I can’t eat ground beef meatloaf anymore. It’s too fatty and rich. Tried this recipe with an elk I harvested in Montana. Family absolutely loved it, and they are requesting it every night. Plan on making it again Saturday with some chopped jalapeños mixed in and putting it on the smoker vs the oven .. can’t wait. Thank you so much for sharing this . I do not even understand how I stopped up here, however I thought this publish used to be good. I do not understand who you’re however definitely you’re going to a famous blogger in the event you aren’t already 😉 Cheers!